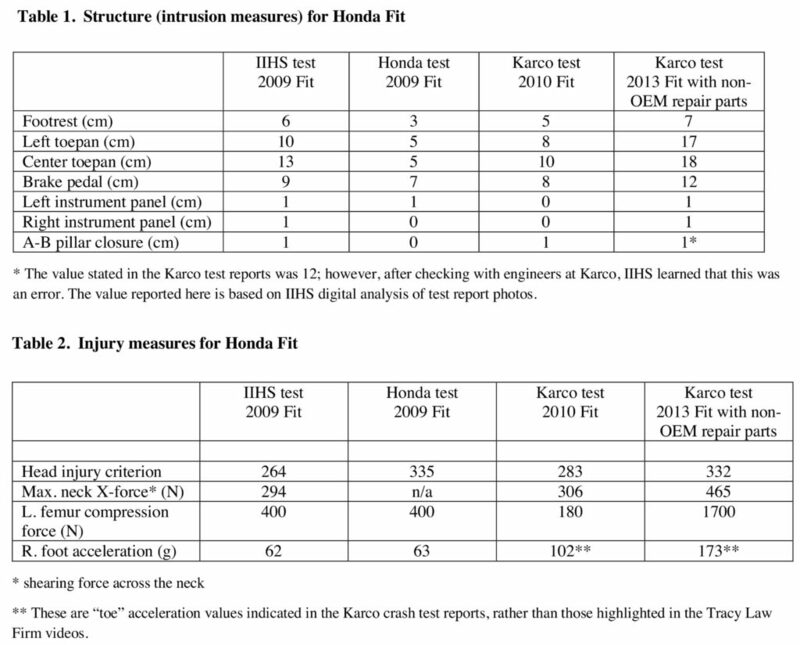 An Insurance Institute for Highway Safety analysis of attorney Todd Tracy’s data concluded that a 2013 Honda Fit crash-tested with numerous aftermarket parts would still have achieved “Good” moderate-overlap ratings. However, it acknowledged that some measurements fell outside the normal range of test variability and indicated increased risk of injuries, even if the overall results fell within the “Good” threshold. 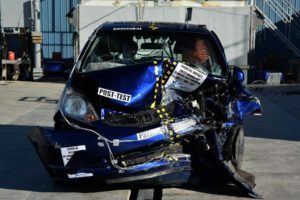 As the IIHS’ moderate-overlap crash testing of a 2009 Honda Fit figured largely in the experiment, “we thought that we should comment on our take,” IIHS Chief Research Officer David Zuby said in an interview Thursday. “It’s hard to pin that necessarily on the parts swaps but … I still think you can’t rule that out,” he said. Tracy, who has said the tests mean “serious and catastrophic injuries follow” from the use of aftermarket parts, said the IIHS analysis actually proved his point — and he thanked them for it. “Replacement structural parts must exactly replicate the original parts to preserve the integrity of a vehicle’s crashworthiness, whether they are sourced from the OEM or an aftermarket supplier,” the IIHS said. “I agree a thousand percent,” Tracy said. Aftermarket parts need to be like kind and quality, and his testing — and the IIHS’s own conclusions — proved they weren’t, according to Tracy. “They’ve admitted what our test did … they’ve admitted there were differences,” Tracy said. “Well guess what? Thank you,” he also said. The 2013 Honda Fit’s imitation components included Certified Automotive Parts Association-certified fenders and a CAPA-certified hood; a NSF-certified bumper reinforcement beam; an uncertified aftermarket radiator support, windshield and drivers-side front wheel; and two uncertified aftermarket hood hinges, according to experiment contributor Burl’s Collision. The aftermarket-parts 2013 Fit posted higher injury-related and intrusion-related results compared to Tracy’s control 2010 Fit and the IIHS and Honda’s own crash-tested unaltered 2009 Fits, but the scores would still be classified as “Good,” the IIHS explained. “Although some of the differences between the tests of the unmodified cars and the test of the 2013 model with non-OEM parts seem large, none of the measures shown in Table 2 represent a high risk of a severe injury,” the IIHS wrote. “(Foot/toe accelerations aren’t related to injury risk.) The HIC values in Table 2, for example, all represent a less than 1 percent risk of severe head injury. Aftermarket parts must be “like kind and quality” and match the OEM versions precisely “by their (the IIHS’) own definition,” Tracy said, referring to the “must exactly replicate” language above. “Well guess what, they didn’t,” he said. He raises a good point: As a consumer contractually assured of receiving like kind and quality parts and an insurer legally obligated to ensure all parts are identical, it’s hard to see how a “Good” but riskier car would be a legally acceptable substitute for the safer baseline “Good” vehicle. The IIHS conclusions might be more relevant and reassuring to an out-of-pocket customer willing to accept a safety downgrade to save money so long as the overall crash performance is “Good.” However, a customer paying monthly premiums for the right to have a pre-loss car with like kind and quality parts might feel shortchanged — as might the legislators and regulators mandating imitation parts be identical. If the question was, however, whether the aftermarket parts in the test introduced “serious degradation” to the driver occupant protection in a moderate-overlap crash, “our conclusion would be no,” Zuby said. “My guess is that no one’s ever tried to do an analysis of what ‘like kind and quality’ means with respect to crash protection,” Zuby said. But if the results fell within the natural variability, “it would be hard to argue … that you changed the ‘like kind and quality'” of the protection afforded the occupants in that “crash mode,” Zuby said. 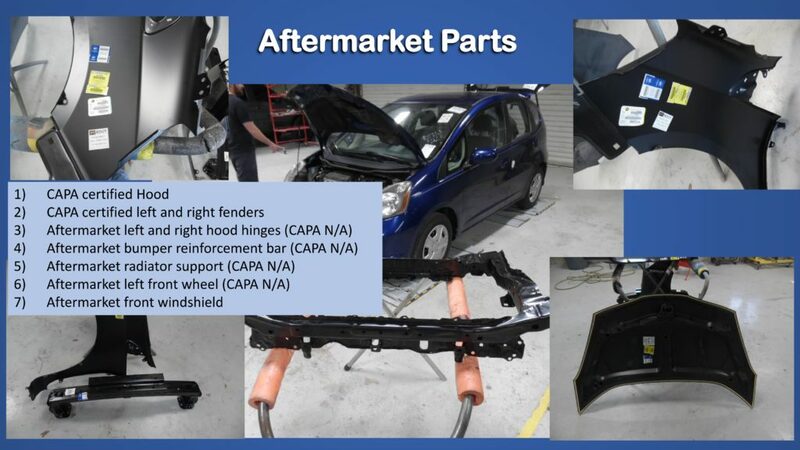 The IIHS determined that many of the increased intrusion and injury scores found on the aftermarket-parts Fit could be passed off as the standard variability its research had found exists between crash-tested unaltered cars. “When you do something like a crash test, you’re never going to get exactly the same results,” Zuby said. The element of variability matters when trying to determine if a variable introduced into the testing legitimately had an effect. The IIHS acknowledged that two measurements were off by “more than would be expected,” though one of these statistics might still have fallen within normal tolerances depending on what ended up being the baseline. One measurement for the driver dummy’s left femur saw the bone experiencing a peak of about 1,685 Newtons, compared to 709 N on the glued-roof Fit and just 180 N on the control Fit. Tracy agreed that “testing slop” might occur, and HIC numbers might be “one or two percent off,” — but the “femurs were quadruple,” Tracy said. “The IIHS Advisory proved our hypothesis that aftermarket parts and non-oem approved repair methods do not perform the same as OEM parts,” Tracy said in a statement. In this case, “we’re using the data he had” and IIHS’ published test protocols, Zuby said. “Anybody could come to the same conclusions that we’ve come in this advisory,” he said.